Reapit is delighted to sponsor Prospect. List. Negotiate. 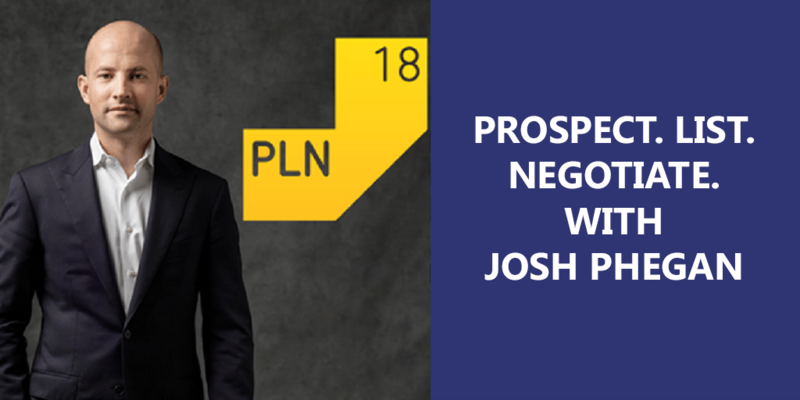 – Josh Phegan’s latest training session in conjunction with the Property Academy. The event will take place at the Millennium Gloucester in London on Friday 13th July 2018. As one of Australia’s leading real estate coaches, Josh promises to deliver an insightful session on how to identify quality leads, handle fee objections and win more instructions. It’s an event not to be missed! At last year’s Property Academy event, Josh highlighted the issue of withdrawn properties and the potential for clients to be actively recommending against the agent who had ‘failed’ to sell their property. This gave us food for thought, as we were in the final stages of testing a new Management Information dashboard to help our clients monitor withdrawals in real-time and drill down to the detail with issues and opportunities. This dashboard has now been successfully deployed and we have since witnessed some frightening figures when looking at individual client data using it. We decided to take a large sample of data from across our client base covering all geographies, agency types and property price ranges in the UK to examine what happened in 2017 in terms of completions and withdrawals. We commissioned an independent data analysis company, Dataloft, to assist in researching this data. The findings are quite staggering; we discovered that an estimated £5 billion was lost in agency commission last year due to withdrawn properties. Attendees at Prospect. List. Negotiate. will receive a complimentary copy of the research report. Attendees will also be offered the opportunity to attend a complimentary breakfast briefing on the research at our offices in Farringdon, London. Find out more about our Management Information suite and our research report by speaking to one of our team members at Prospect. List. Negotiate. or by getting in touch with us today.